All I can do at this point is to laugh. Initially, the pump from Savannah River Site, and another 70-meter Putzmeister now at a construction site in California, will be used to pump water—and later will be used to move concrete. “Our understanding is, they are preparing to go to next phase and it will require a lot of concrete,” Ashmore said, noting that the 70-meter pump can move 210 cubic yards of concrete per hour. Putzmeister equipment was also used in the 1980s, when massive amounts of concrete were used to entomb the melted core of the reactor at Chernobyl. In addition to the equipment now at Fukushima and the two 70-meter pumps being moved from the U.S., a contractor in Vietnam has given up a 58-meter pump so it can be diverted to Japan, and two 62-meter pumps in Germany were loaded on Wednesday for transport to Tokyo. Ashmore officials have already notified Shaw AREVA MOX Services, which is building the MOX plant for the U.S. Department of Energy’s National Nuclear Security Administration, that the pump was being moved and will not be returned. “It will be too hot to come back,” Ashmore said. The MOX complex, scheduled to open in 2016, is designed to dispose of 32 metric tons plutonium from dismantled nuclear bombs by blending small amounts of the material with uranium to make nuclear fuel for commercial power reactors. Its design calls for 170,000 cubic yards of concrete strengthened with 35,000 tons of reinforcing steel bars. The absence of the pump will not affect the U.S. project’s construction schedule, Ashmore said, noting that there are several slightly smaller units still at the MOX site and being used by the civil contractor, Alberici Constructors. There is also the third existing 70-meter Putzmeister that is in the U.S., but not in a state where it could easily be retrofitted for shipment to Japan. “We may try to buy that one later if we need to,” he said. それでも、Information wants to be free, and it is free. Heute schwacher Störungseinfluss mit leichten Schauern im Norden des Krisengebietes, aber niederschlagsfrei von Fukushima bis Tokyo. Winde sind aus nordwestlichen Richtungen, drehen aber im Laufe des Tages auf Südwest. Morgen sind weiter ein paar schwache Schauer möglich, meistens ist es aber trocken. Wind aus vorwiegend südlichen Richtungen. Übermorgen Annäherung einer Störung, die in der Folge Niederschlag bringt. Der Wind dreht auf westliche Richtungen. Die Ausbreitungsrechnungen zeigen, dass heute eine potentielle Strahlenwolke Richtung Südosten auf den Pazifik transportiert wird, also weg von Japan. Morgen sind durch Drehung des Windes auf Südwest weitere Transporte Richtung Pazifik zu erwarten. Übermorgen können vorübergehend auch Gebiete im Landesinnere betroffen sein (siehe Abbildungen unten). Die Farbskalierung zeigt derzeit insgesamt 5 Farben. Mit „Area E“ werden Gebiete gekennzeichnet, die derzeit mit einer Effektivdosis von ca. 10 Milli-Sievert pro Stunde belastet werden, was aufgrund der Daten in einer 25x25 km2 Box eine Maximalabschätzung ist. Die „Area A“ (violette Farbe) begrenzt eine Region mit einer maximalen Belastung von 0,3 Mikro-Sievert pro Stunde. Dieser Wert entspricht der Dosisleistung der mittleren globalen Hintergrundbelastung. During the reactor accident in Chernobyl in 1986, the total releases of Iodine-131 and Cesium-137 (whole accident scenario) were 1.76 1018 Bq and 8.5 1016 Bq, respectively. The three day emissions from Fukushima of Iodine-131 would be about 20% of the total Chernobyl emissions, while those of Cesium-137 would be between 20 and 60% of the total Chernobyl emissions, depending whether one believes in the different Iodine to Caesium ratio measured in Japan. ふうん、これは何だろう、と思って、グーグルのキャッシュを調べたら、まだちゃんとありました。記事をサイトからおろした（おろさせた）のは、さて誰でしょう？Not very hard to figure out, is it? Confirming that in a time of instantaneous crowdsourced information distribution and analysis, any attempt by a government to institute an information blackout of any nature is doomed to failure, is the following amazing Google Earth-based 3D interactive map of Geiger readings from Japan. 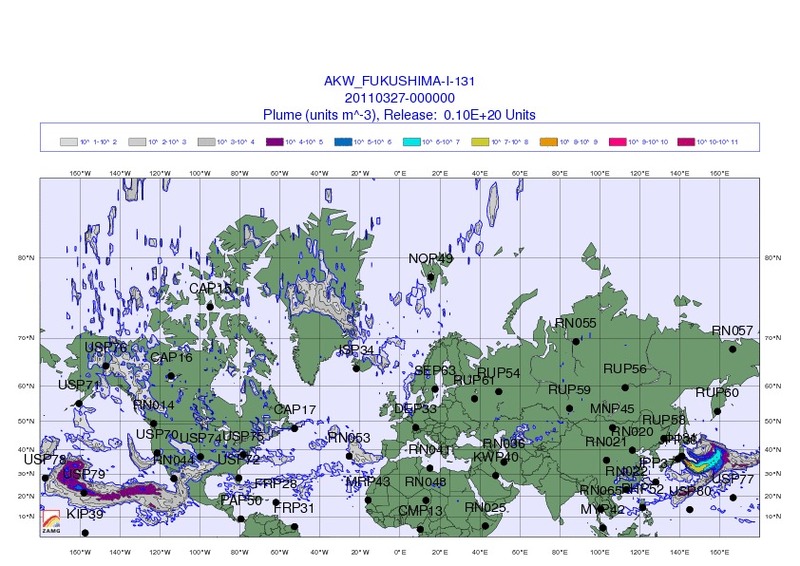 And if that is not enough, the Pachube community has released an extensive selection of crowd-sourced realtime radiation monitoring tools and widgets, focusing on as many Japanese territories as possible. Shortly we are confident all geographical holes will be filled, and every square mile of the affected territories will be mapped out surpassed the government's "Under Survey" blackout attempts.